As I have written previously, alcohol in wine is a seducer with a punch. It stimulates the appetite, offers gustatory pleasure, and leads to relaxation, more social interaction and even procreation. Alcohol contributes body, texture, intensity and sweetness that makes fruit in wine seem fuller and broader. Since alcohol is a solvent, it can extract more flavor out of skins, pips and oak barrels. It is a critical factor in wine balance which in turn is an important feature that determines wine quality. It is well documented that alcohol levels in wine have risen significantly over the last few decades. Data from the Alcohol Tobacco Tax and Trade Bureau (TTB) indicate that the quantity of higher alcohol wines produced in the United States over the last decade increased 50% on a relative basis to 9% of bottled still wines. Despite its allure, and the happy buzz that accompanies its ingestion, alcohol can be devilish. At higher levels, it suppresses fruit aromas on the nose by secluding aroma molecules, preventing them from being released into the air. Alcohol has no taste per se, but it can overpower the palate, preventing recognition of the varietal, obscuring the perception of phenols, lowering the perception of nuances and thus complexity in wine, and disguising terroir by obscuring flavors. At levels of 15% or more in wine, alcohol can cause a burning sensation in the nostrils and create a sense of bitterness and heat on the finish. High alcohol wines have become the bane of many sommeliers who find it can disrupt balance in wine, diffuse the taste buds, and create an undesirable amplification of certain elements in a dish. Outspoken sommeliers have caught the ire of some notable winemakers whose wines often clock in at the upper ranges of alcohol percentage including Helen Turley, who crafts popular Chardonnay and Pinot Noir wines at Marcassin. She has called this cadre of sommeliers who reject higher alcohol wines “Dim Somms,” and this has created quite a stir among the wine community. The best commentary on this ongoing feud was posted by the HoseMaster of Wine in his blog at http://www.hosemasterofwine.blogspot.com/2014/09/ipob-attacks.html Hilarious! A majority of the wine-drinking population is unfazed by higher alcohols in wine, and usually do not consider alcohol percentage by volume (ABV) when picking a wine. This is largely a result of genetics. 50% of the population have one dominant and one recessive gene for taste and are termed “regular” tasters. As a group, these wine drinkers choose moderate flavors and are only mildly sensitive to tannin, sugar and high alcohol. 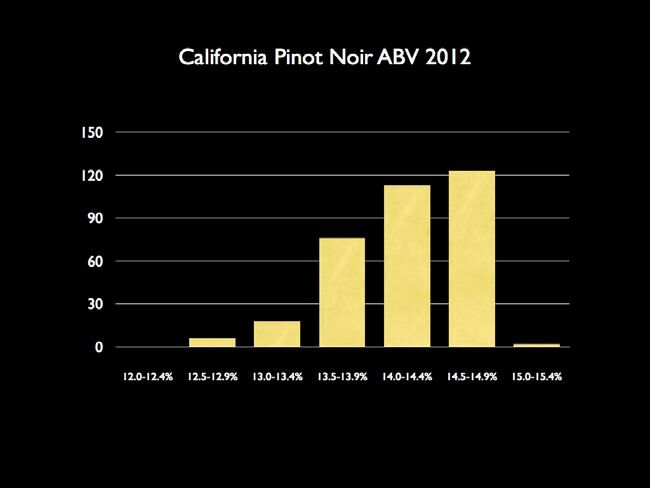 I canvased the ABV of all California and Oregon Pinot Noirs from the 2010, 2011 and 2012 vintages that have been reviewed in the PinotFile to date. 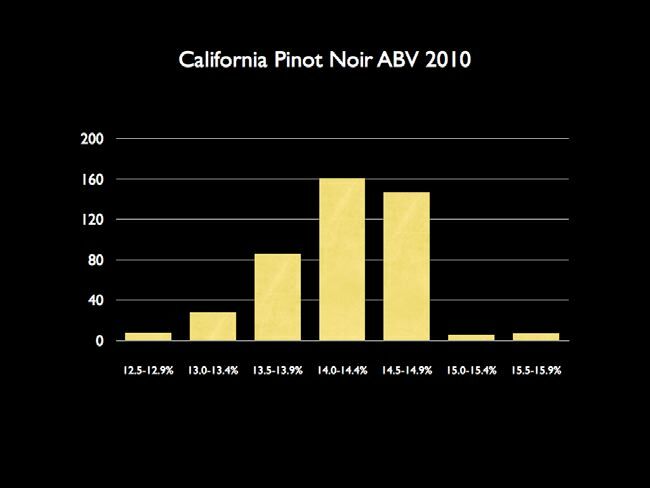 Each vintage is presented in a bar chart below. Remember that ABV is not an exact figure. A study reported in Wines & Spirits (Fall 2010), found that 10% of the wines tested significantly exceeded the legal boundaries, indicating that wines can have significantly more alcohol than the stated ABV on the label. The ABV on the label is not required by the TTB to be accurate because a range of tolerance is permitted. Wines of 14% alcohol or less are allowed a 1.5% margin of error, and wines over 14%, a 1% margin of error. Therefore a wine that is 12.5% alcohol, may be labeled anywhere from 11.0% to 14.0% alcohol, and a wine labeled 15.0% might be anywhere from 14.01% to 16.0% alcohol. A wine with more than 14.0% alcohol cannot be labeled as containing less alcohol and vice versa. The ABV values used in this survey are primarily from the percentage stated on the label. Labels are often printed before a wine is bottled and released, so that the label ABV may not be the same as the final in bottle ABV stated on the winery’s tech sheets. On the charts below, the x axis represents the number of wines and the y axis the ABV range. What information can be gleamed from this survey? 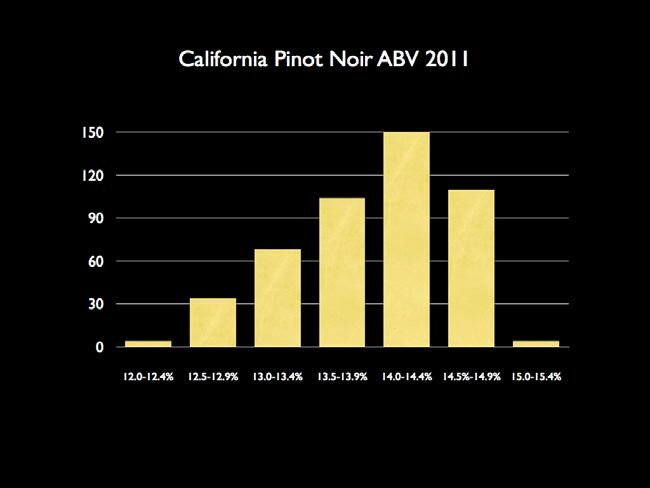 ** California Pinot Noir ABV was predominantly in the 14.0%-14.9% range with 70% of the wines in this range in 2010, 55% in the cooler 2011 vintage, and 78% in the warmer 2012 vintage. 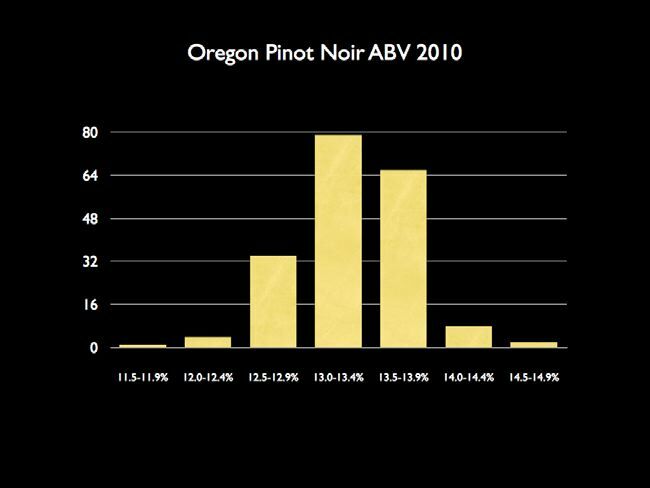 A significant number of wines were at or above 14.5% and since winemakers often downplay the true ABV, and given the 1% leeway above 14.0% ABV, it is easy to speculate that a number of these Pinot Noirs were over 15% alcohol. 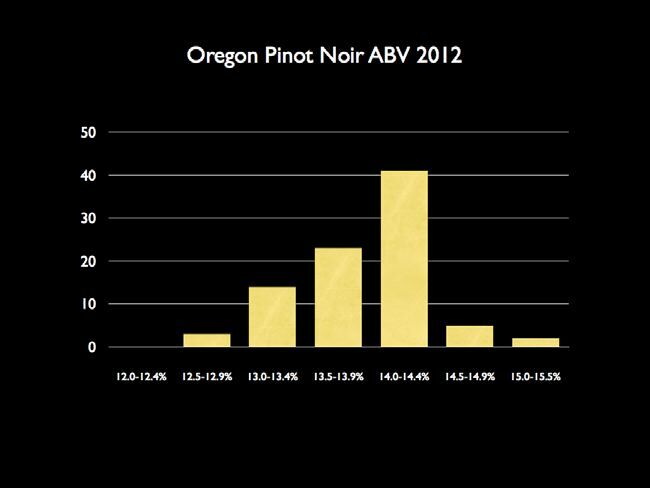 ** Oregon Pinot Noir ABV was predominantly in the 13.0%-13.9% range in the cool 2010 and 2011 vintages (75% and 67% respectively). In the warmer 2012 vintage, only 45% of the wines were in the 13.0%-13.9% range, while 53% of the wines were in the 14.0%-14.9% range, although overwhelmingly in the 14.0%-14.5% range. 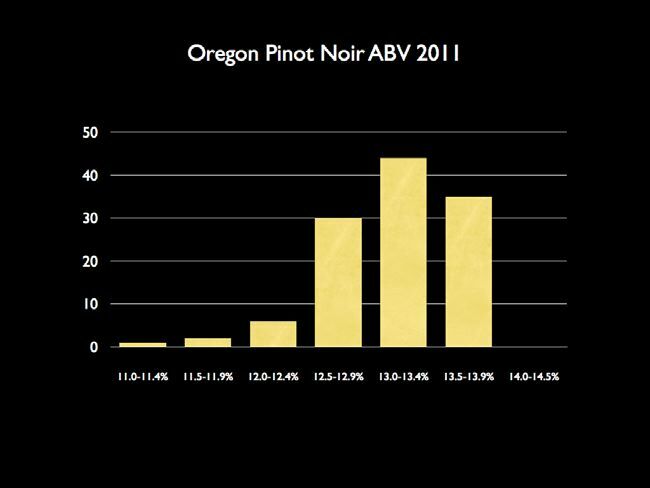 Oregon shows more vintage variation in grape ripeness and resulting ABV in the finished Pinot Noir wines. Do alcohol levels in Pinot Noir matter? Well, higher alcohol Pinot Noirs will surely get you sideways a lot quicker, but is that the goal? ABV does matter when you are looking to drink in moderation. A bottle of Pinot Noir at 15% ABV contains 15% more alcohol than a bottle of wine containing 12% ABV. One should consider scaling back the volume of wine drunk when imbibing a wine with a higher alcohol percentage (above 14.5%), or reach for a lower alcohol wine to insure that you stay within the confines of moderation and avoid the damaging health risks associated with heavy alcohol intake. I have been a long time proponent of listing ABV on wines I review in the PinotFile, and I believe I was the first wine publication to implement this practice on a consistent basis. Unfortunately for the consumer, the ABV is often presented on a wine label in very small print (only 0.5 mm font size is required) and in some cases in a poorly contrasting color, so that it is virtually unreadable without a magnifying glass.